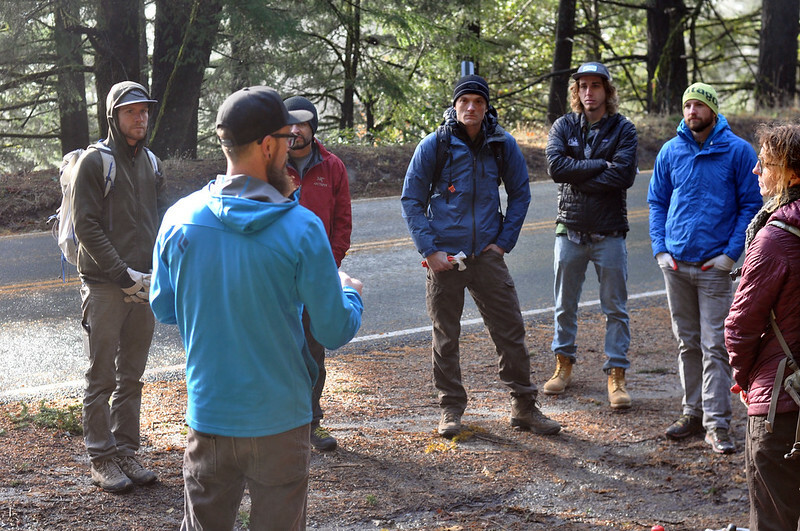 In the waning days of 2015, the Bay Area Climbers Coalition (BACC) organized stewardship days at Indian Rock and Mortar Rock, two popular crags in Berkeley with a rich climbing history, and again at the Biddles, a lesser-known outcrop nearby. The BACC is a non-profit with a local focus of protecting and caring for the places climbers love. They’re known for outworking tractors with sheer people-power, and for relentlessly wading through red tape in the pursuit of their goals. These shovel-wielding warriors heft contractor bags full of broken glass and spent climbers tape, and do it with a smile. PG staff regularly join in for these fun, rewarding events. It’s said that it’s better to give than receive—well, PG/BACC clean-ups include a little of both, as work is often followed by pizza. 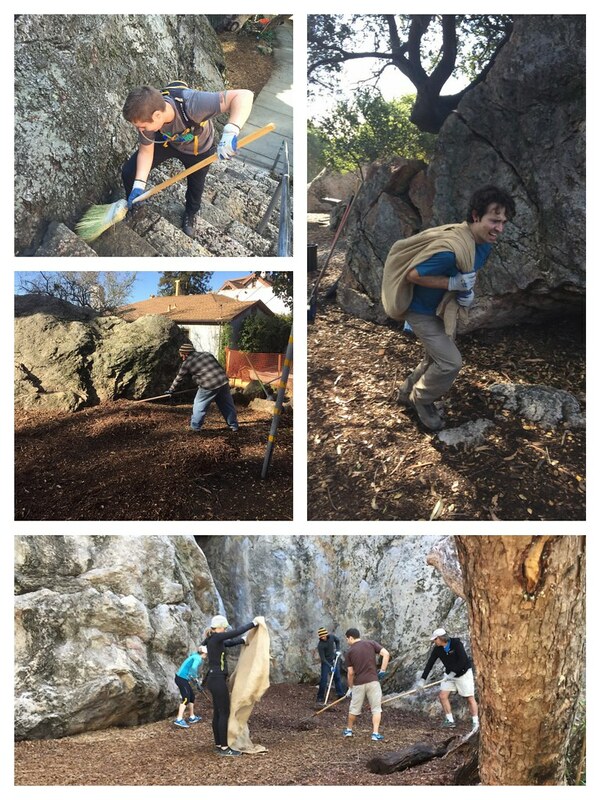 At the Indian Rock cleanup, bags of trash were stacked high, and mountains of wood chips were distributed, providing a beautiful shared space to be enjoyed by climbers, joggers, dog walkers, and community members in the New Year. With more than 30 volunteers, all this work was accomplished in just three hours. Working with the group was a delight. The stoke and gumption of the crew made an elated cleaning party out of picking up trash, hauling heavy sacks of woodchips, and meticulously weeding and sweeping the walking paths. The community members that came to enjoy the park that day were surprised to find the usual population of scruffy climbers grappling with brooms instead of boulders, and they were even more surprised to learn that we were only doing it for karma and pizza. A few weeks later, the BACC rallied PG staff again, for a more secluded job. 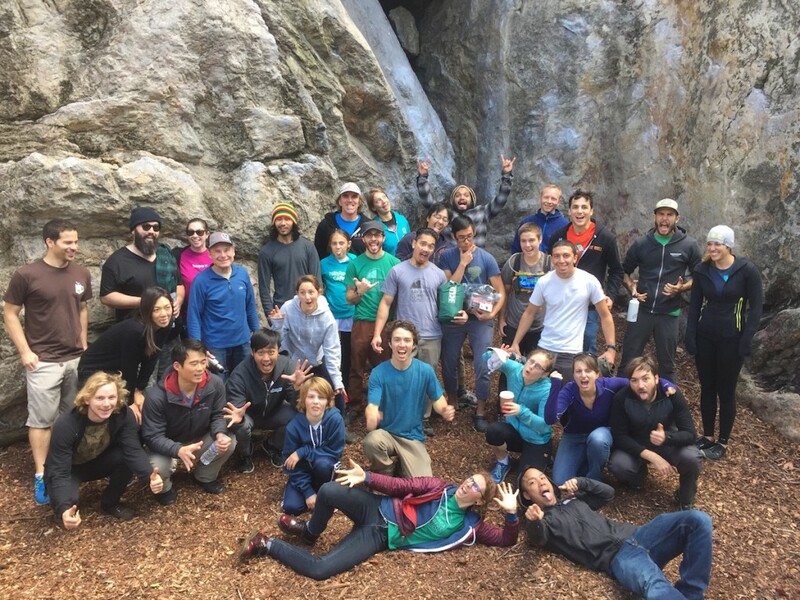 Of all the Bay Area’s crags, the Biddles area, about a mile down the road outside of Castle Rock State Park, is one of the lesser-known areas in the Castle Rock bouldering circuit. 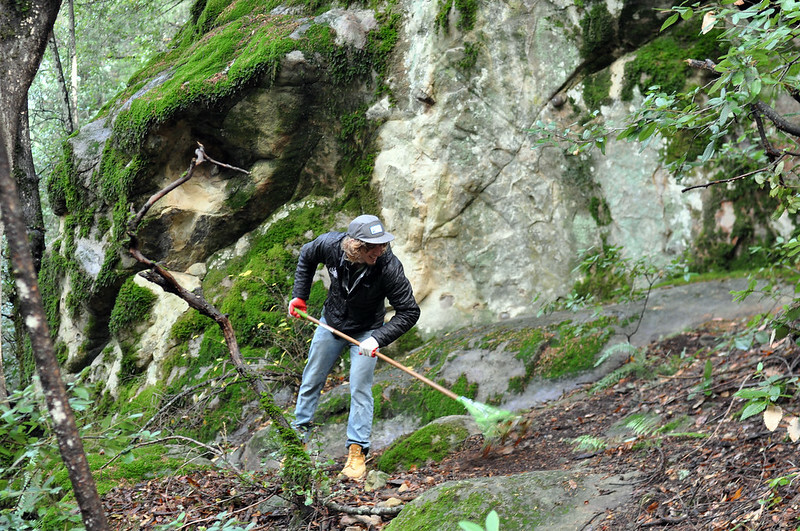 Ulery laid down the plan for the misty/rainy day in the woods: cover the climbers’ trailhead to avoid accidental hiker traffic, clean up branches along the rest of the trail, and define the edges of the trails. “The Upper Biddles has everything from V0 to V6. It’s a more accessible crag for the masses,” Ulery said. After edging that trail and cleaning away debris, the group turned to a slippery snaking trek up a switchback path to a mossy, sentinel of a boulder on top of a ridge: “Biddles Tower,” which has a tough V3 and V5’s to V7’s, Ulery said. Click on this Flickr album to view more Biddles cleanup photos! The switchback trail got some well-placed heavy rocks on its hard curves, and a stream of climbers tamping down the ground in the mist. At the end of the day, the weary once again enjoyed their pizza reward. The BACC welcomes volunteers, and its next event open to all volunteers will likely be in February, Ulery said. Check out the BACC’s website or Facebook page for more details—and keep an eye on the PG blog as well for news of new stewardship days!